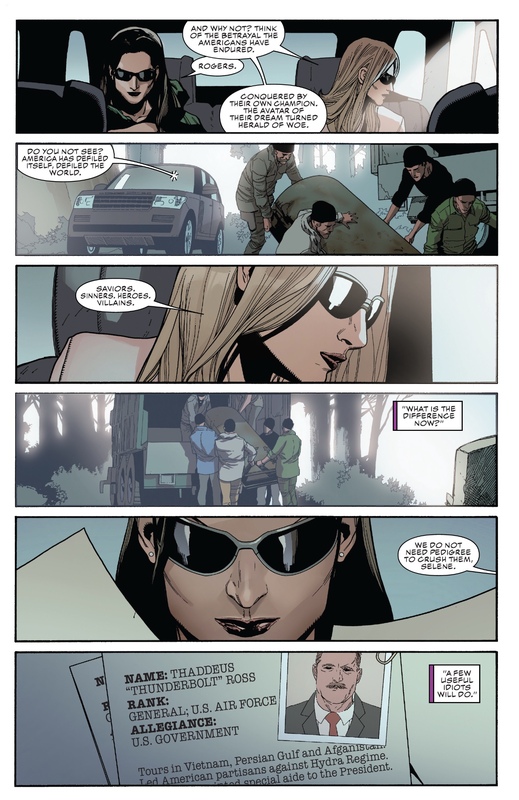 Plot: Captain America continues his rescue of Sharon Carter. Unfortunately Cap’s actions over the past few issues reach the media causing General Ross to disavow Cap on behalf of the U.S. Government. Meanwhile the Power Elite resurrects Alexander Lukin but they may have brought back someone way worse. Story: Ta-Nehisi Coates’s dialogue is one consistently good thing about this title. He does an excellent job conveying each character’s emotions to the reader through their words. The best example of his work is the caption boxes for Captain America. Coates gives readers the chance to really understand how Cap thinks in battle and which strategies he chooses. Plus Coates’s words for Cap outside of battle really show how difficult the road ahead is for Steve Rogers. 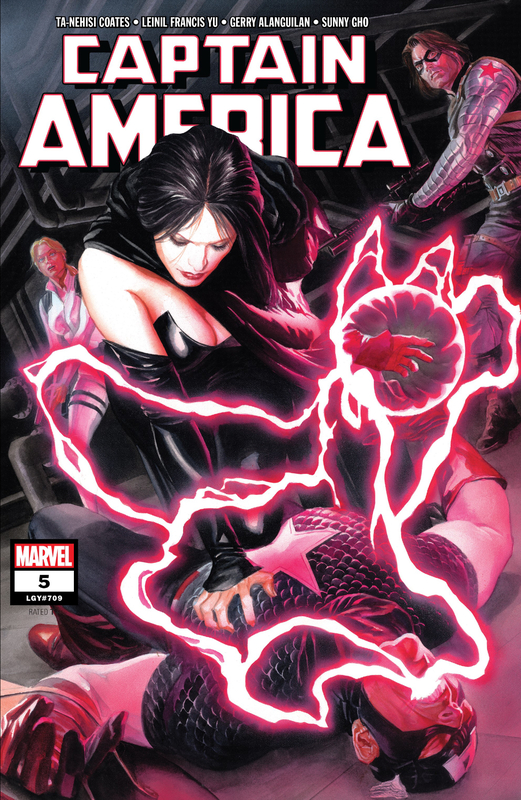 The current arc, Winter in America, takes place during a time when the United States in the Marvel Universe is politically fractured. This is a clear reference to what’s going on in the U.S. today. I enjoyed the way Coates wrote this story and handled this topic without being too “in your face” to the reader. Also while politics in comics isn’t new, it is something that readers should expect from Captain America. Especially since the character was created in response to a major historical event. The biggest surprise of this issue came from Alexander Lukin’s resurrection. If you read Ed Brubaker’s Captain America run then you should know Lukin shared a body with the Red Skull. Now the Power Elite (led by Lukin’s wife, Alexa) successfully brought back Lukin. However the last page reveals the Red Skull hitched a ride back too. 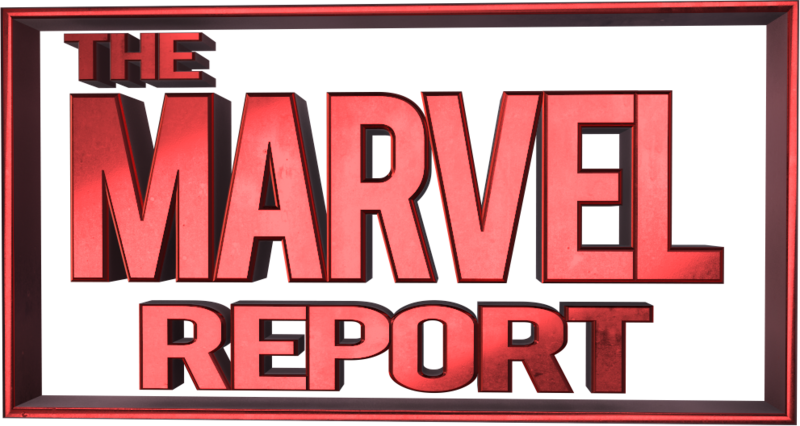 The Red Skull’s return adds a more personal connection for Cap’s fight against the Power Elite. 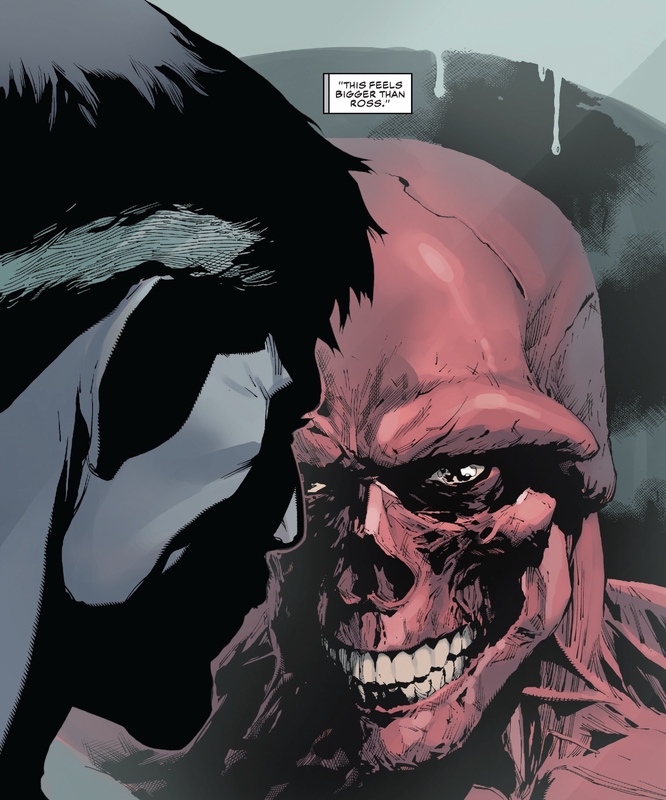 Also readers don’t know if the Red Skull is in full control or he’s sharing a body with Lukin again. Either way this opens up some more possibilities for this story. Art: This issue’s artwork is impressive. 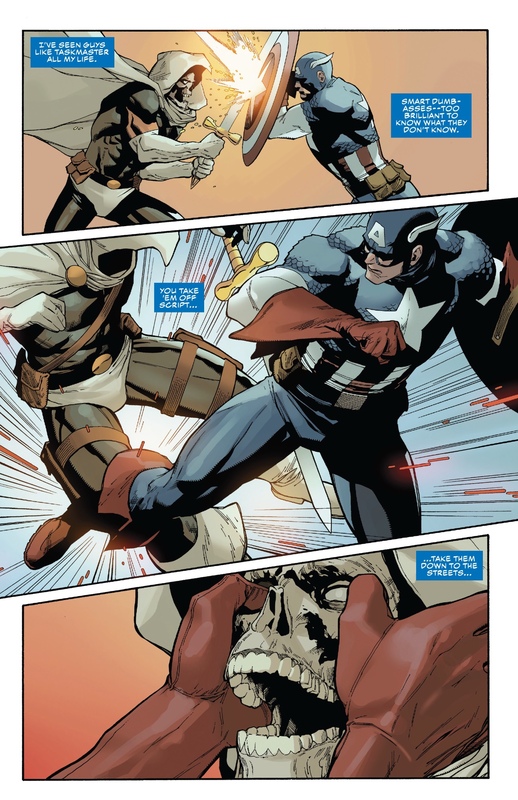 The best example is Cap’s fight with Taskmaster. Their fight is filled with amazing shots that are action-packed and dynamic. Also there’s a really great coloring choice where red and blue colors were kept to a minimum. The only time I noticed red and blue used were for Cap’s costume which really helped the character stand out. Plus throughout the issue the facial expressions were on point. The characters faces did a great job conveying their emotions to the reader and working with Coates’s dialogue. Verdict: A common complaint I had with the last few issues was the lack of plot development. Fortunately this issue really got the story moving in a big way. Using Alexander Lukin as a way to bring back the Red Skull was unexpectedly brilliant. Plus there’s some amazing political parallels which is a big plus for a Captain America story. This was a thrilling penultimate issue and I can’t wait to read the ending next issue.